HOUSTON (ICIS)--Negotiations for the reworking of NAFTA – the nearly 24-year-old free-trade agreement between the US, Canada and Mexico – is set to finish in 2018, but forecasters are virtually split over what a renegotiated NAFTA could mean, if it manages to occur at all. The National Association for Business Economics (NABE) noted in its December survey that a larger number of economic forecasters felt the renegotiation of NAFTA could at least have a marginal negative net impact on the US economy. Approximately 46% of the 51 panelists surveyed believed in the chance for negative impact, compared with 33% who feel it will have at least a marginally net positive impact. Eugenio Manzano, executive director of Mexican chemical distributor Pochteca, said earlier in the year that if the free-trade agreement expires, tariffs between Mexico, the US and Canada would fall under rates dictated by the World Trade Organization (WTO). These set tariffs of 2-6% for most products. Geopolitical strategist Peter Zeihan highlighted that the timing of publicly negative US/Mexico relations, combined with several other issues, is working against the agreement, at least for now. “The single biggest thing that has changed over the month, is that relations with Mexico have gotten so bad, that we’ve gone from thinking that NAFTA was going to get a little bit of a brush up, to a 50/50 chance that it’s going to be gone next year,” Zeihan said. Several factors are playing into negative relations, ranging from immigration issues, reactions to inflammatory comments made by US President Donald Trump, as well as a possible resurgence in Mexican drug violence along the US/Mexico border. Public opinion issues and international relations are conflagrated by upcoming elections, Zeihan noted. He cited former White House chief of staff Steve Bannon as an example. Bannon, Zeihan said, has been backing candidates in the 2018 US Congressional elections in an attempt to unseat incumbent Republican members of Congress who are, among other things, pro-free trade. In addition, Mexico's presidential election is also occurring in 2018. Front-runner Andres Manuel Lopez Obrador, leader of the populist group MORENA, has repeatedly opposed NAFTA. According to Zeihan, Obrador’s popularity is in part due to Mexican citizens current viewpoints on Trump. However, chemical executives in Mexico expected NAFTA would be renewed because the trade agreement has provided so many benefits to its members. For energy alone, the US and Mexico are tightly integrated. Mexico exports oil to the US, where it is refined and sent back as diesel and gasoline. In fact, Mexico relies on US exports to help meet more than half of the country's demand for gasoline. Likewise, for natural gas, Mexico relies on US pipeline imports to meet more than half of its demand. The fuel is powering the country's manufacturing sector, which exports finished goods back to the US. For Mexico's chemical industry, trade with the US is critical, since its refineries lack the scale and reliability to meet domestic demand, making the country a critical source for propylene and aromatics. For PE and other ethylene derivatives, Mexico lacks the ethane needed to expand capacity. Until Mexico can increase ethane production, it will rely on imports of ethylene derivatives to help meet growing demand. The US would be a logical source for these imports, since the country is starting up several new PE plants. Mexico may even import ethane itself to make up for some of its shortages in ethylene. NAFTA provides Mexico's petrochemical industry with easy access to feedstock from a next-door neighbour with some of the world's lowest production costs. Plastic processors enjoy similar benefit. The plastics industries in Mexico and the US are well aware of the benefits of the current arrangement, and their corresponding trade groups are working with their peers in Canada to preserve NAFTA. Many in the chemical industry expect NAFTA will be signed, despite the contentious tone of the negotiations. But if NAFTA were allowed to lapse, Mexico should still be able to prosper, Manzano said. The rates are too small to be significantly disruptive, Manzano said, especially given the degree of integration among the supply chains of the three countries. Still, there will be some disruptions to the economy. The Mexican peso could become more volatile, weakening when NAFTA appears in danger of expiring and strengthened when it appears likely to be renewed. Though relations between the US and Canada are much less volatile, issues are likewise present. Canada’s ambassador, David MacNaughton, said in a November interview with US media that NAFTA needed to be reworked in such a way as to promote job growth for both countries. "If what is happening here is the negotiation is all about how do we increase production in the US, whether it be in autos or anywhere else, at the expense of Canada and Mexico, this is not going to end well,” he said. The US, Canada and Mexico will schedule more negotiating rounds into the first quarter of 2018. 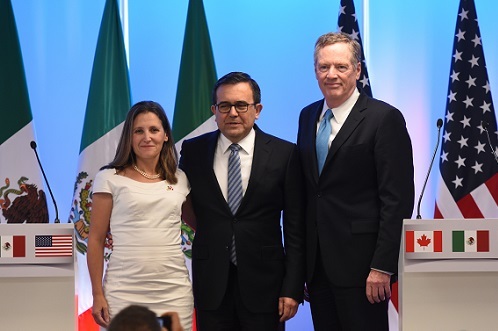 Pictured are Minister of Foreign Affairs of Canada Chrystia Freeland, Mexico's Secretary of Economy Ildefonso Guajardo Villarreal and United States Trade Representative Robert Lighthizer during a meeting in September (Credit: Carlos Tischler/REX/Shutterstock).